Plain, simple, unpretentious and delicious. Traditional Latin fare, with cuisine of Columbia their specialty, and the prices are reasonable. 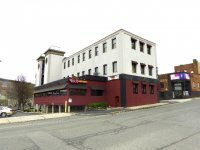 In the heart of Pittsfield driving or walking by Panchos Mexican Restaurant looks lively and enticing for those hungry for flavorful, affordable ethnic food. The cuisine however did not match the colorful decor. This vast restaurant on the main drag between Pittsfield and Lenox changes hands and food themes every couple of years. Tex Mex attracts drive by tourists during high season but is on life support during the winter months. In order to survive restaurants must attract a local audience to sustain year round. Significantly, during our disappointing visit the cavernous space was virtually empty. For those seeking authentic Colombian cuisine La Fogata in Pittsfield has become an essential destination. It is readily accessible on a main route into the downtown. It has been a favorite restaurant of Pancho's for several years. We compared notes of multiple visits to give an in depth report on the full range of an extensive menu. The chef and owner Miguel Gomez brings family food of the other to the starving Berkshires. An eclectic array of possibilities makes this the richest Fall arts season yet.